Whether it be for beach reading or a back to school escape, banned books make excellent additions to anyone’s public and personal libraries! Celebrating not only great literature, but also the women who create it, Bustle’s Blaire Perel pulled together a list of her favorite challenged reads highlighting eleven banned books and graphic novels written by women, and the list includes graphic novels! From contemporary coming-of-age titles like What My Mother Doesn’t Know, which tells the story of a 14-year-old teen learning to cope with growing up, to classics like The Upstairs Room, an autobiographical tale of author Johanna Reiss and her older sister’s experiences in Nazi-occupied Holland, Perel’s list collects titles that are both award-winning and have been targeted and challenged at schools and libraries around the world. “Unfortunately, so many books have been banned, called ‘vulgar,’ ‘inappropriate,’ and ‘offensive,’ that picking a title from the banned-book pile isn’t an easy feat,” writes Perel. Another book that made the list was Jeanette Walls’ The Glass Castle, which was recently included in a suspended school reading list along with six other titles at Highland Park High School in Texas. CBLDF joined the Kids’ Right to Read project to protest the move, and the decision was ultimately reversed, but the critically acclaimed memoir that deals with issues of child neglect has seen its fair share of challenges since its initial publication. To round off the list are the two graphic novels, Persepolis and Fun Home — both graphic memoirs that have been credited as two of the most frequently challenged graphic novels in the US at both the primary and secondary school levels. Persepolis by Marjane Sartrapi recounts her personal experiences growing up during the Islamic Revolution in Iran and has become one of the most critically acclaimed modern graphic novels, but it has also become a consistent target of censors, with attempt to ban it in Chicago, Illinois; Smithville, Texas; and most recently Yucaipa, California. Similarly, Alison Bechdel’s Family Tragicomic, Fun Home, has also seen immense success and praise, but it has also been under consistent attack for what censors call “pornographic content.” From libraries in Missouri, to university classrooms at the University of Utah, College of Charleston in South Carolina, and Crafton Hills College in California, Bechdel’s graphic memoir continues to be one of the most challenged graphic novels at the university level. These are just a few of the great books that Perel has pulled together for her list. 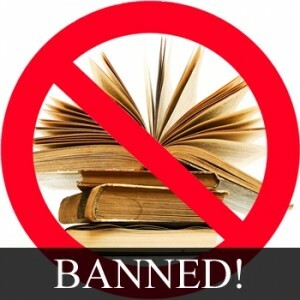 She also reminds readers that along with these all being fantastic books, it is important to recognize and support banned books and their creators in order to undermine the attacks that would prohibit people from their right to read. There’s one upside to book-banning: it’s that kind of like anything-banning, the more you take something away, the more people want it. Is it the danger? The mystery? (The ridiculousness of a book being banned in the first place?) Whatever it is, reading banned books is a fantastic idea. Not only are you telling those who are pro-censorship that you’re not going to take any of their BS, but you also just might get a little thrill from getting your paws on the prohibited. Check out Perel’s full list here!